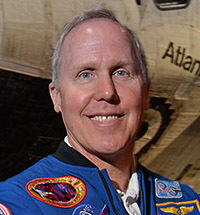 Thomas D. Jones, PhD, is a scientist, author, pilot, and former NASA astronaut. He holds a doctorate in planetary sciences, and in more than eleven years with NASA, flew on four space shuttle missions to Earth orbit. On his last flight, Dr. Jones led three spacewalks to install the centerpiece of the International Space Station, the American Destiny laboratory. He has spent fifty-three days working and living in space. A distinguished graduate of the Air Force Academy, Tom piloted B-52D strategic bombers, studied asteroids for NASA, engineered intelligence-gathering systems for the CIA, and as a NASA contractor, developed advanced mission concepts to explore the solar system. Tom is the author of three recent space and aviation books: Planetology, (written with Ellen Stofan), Hell Hawks! The Untold Story of the American Fliers Who Savaged Hitler's Wehrmacht (with Robert F. Dorr), and Sky Walking: An Astronaut's Memoir, which was named by the Wall Street Journal as one of its "Five Best" books about space. He also is the author Mission: Earth and The Scholastic Encyclopedia of the U.S. at War for young readers. 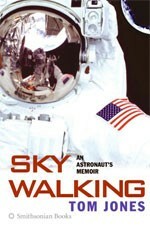 He writes frequently for Air & Space Smithsonian, Aerospace America, Popular Mechanics, and American Heritage magazines. Dr. Jones' awards include the NASA Distinguished Service Medal, four NASA Space Flight Medals, the NASA Exceptional Service award, the NASA Outstanding Leadership Medal, the NASA Exceptional Public Service award, Phi Beta Kappa, and the Air Force Commendation Medal. King's College of Wilkes-Barre, Pennsylvania awarded him an honorary doctorate in 2007 and the Main Belt asteroid 1082 TomJones is named in his honor. Tom served on the NASA Advisory Council and is a board member of the Association of Space Explorers and the Astronauts Memorial Foundation. As a senior research scientist at the Florida Institute for Human and Machine Cognition, he focuses on the future direction of human space exploration, uses of asteroid and space resources, and planetary defense. He appears frequently on-air with expert commentary on science and space flight. "We have had continuing comments ever since the Summit regarding your presentation. Everyone thought that it was absolutely fantastic and just perfect for our audience.Every year we try to top previous year's -this one was unstoppable- how's that for a new word?" "I observed the audience during your presentation and they were sitting there in awe. It is fantastic to know they were very pleased and we heard from many attendees who said, this was the best awards luncheon we had ever had." "My husband and I enjoyed your talks beyond all others! We were on our 3rd 'Grand Voyage', hence dozens of speakers and your delivery beat them all. Of course, your first-hand subject matter is what drew us in. Thanks for making that part of the voyage so memorable." "Dr. Tom Jones is clearly an expert on space operations and his ability to clearly describe his space operation experiences made his lecture a great learning experience for all. He clearly articulates the challenges of space operations and offers insight into how best to meet these challenges in the future. I highly recommend Dr. Tom Jones as a speaker. You’ll be entertained and educated at the same time!" "I saw the keynote address. Dr. Tom Jones was magnificent. He was inspiring. And he told us things I hadn't heard before."